Sakai Community DocumentationSakai 19 User Guide (English) AccessibilityHow do I check my content for accessibility? 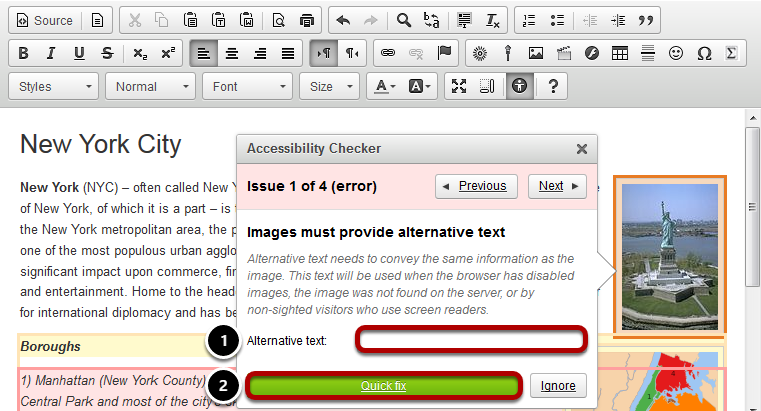 Note: The Accessibility Checker is a third party add-on for the rich text editor. While it is open source software, the licensing guidelines do not allow it to come packaged with Sakai. If your institution has installed this add-on, the features described below will be available. If you do not see the Accessibility Checker icon, that means that your institution has not installed this add-on. 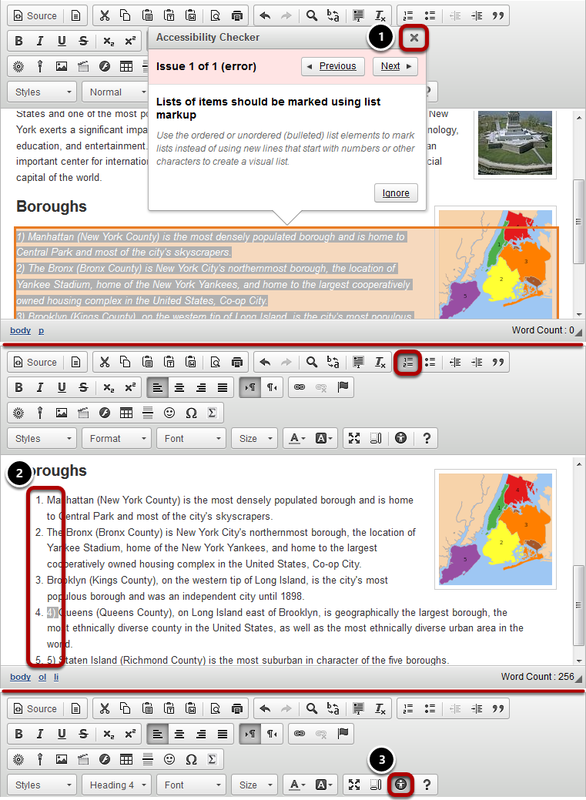 You can use the Accessibility Checker to inspect the accessibility level of content created in the Rich-Text Editor and immediately solve any issues that are found. 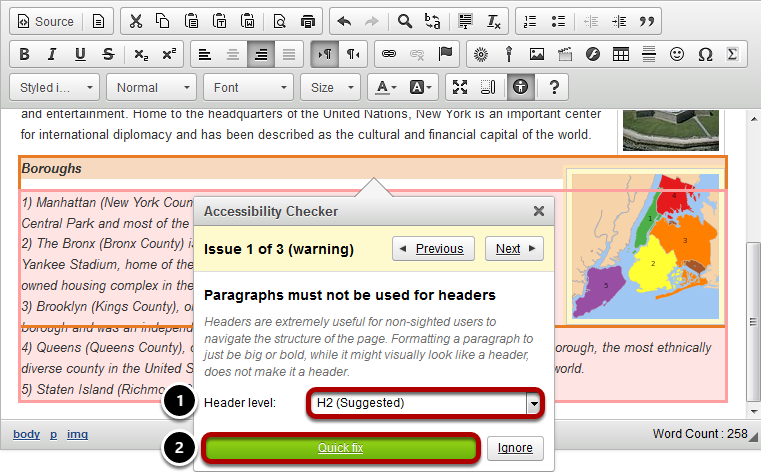 The Accessibility Checker presents issues with each item in the editor one at a time. For many issues, the Accessibility Checker gives you a Quick fix option. If a Quick fix is not available, the checker will describe what needs to be done to fix the issue. Select the Accessibility Checker button. The Accessibility Checker button looks like a human inside a dark-gray circle. Use Quick fix options to correct issues. The accessibility checker has multiple Quick fix options to correct accessibility issues. Below are a few of the most commonly used ones. If you have an image that lacks Alternative Text, enter a short, meaningful description for the image in the text box provided. Click the Quick fix button. If the image requires a longer description, include that description in the body of the document. If the text you would normally use as alternative text would be redundant to your description, leave the Alternative text box blank instead. If the image is purely decorative or used for visual formatting (e.g., a decorative horizontal bar that has no meaning, but separates text on the page), the alternative text description should be left blank to hide it from users of assistive technology. For more information about creating meaningful text alternatives for images, see How can I make images more accessible? Structuring your document with paragraph headings helps users of assistive technology navigate the page and "skim" content to get to what they need. Select a Header level from the drop-down menu (the accessibility checker will automatically suggest a header level for you). Users of screen readers cannot read tables the same way sighted users do. Sighted users can tell at a glance what column and row a given cell is associated with, but a screen reader user needs a table to include appropriate headers and captions so that they can match up content in columns and rows. From the Position drop-down menu, select where the headers belong in the table. Choosing Horizontally makes the text in the first row into headers, i.e., the text in each column of the first row becomes the title of that column. Choosing Vertically makes the text in the first column into headers, i.e., the text in each row of the first column will be the title of that row. Choosing Both puts headers in both the first row and the first column. 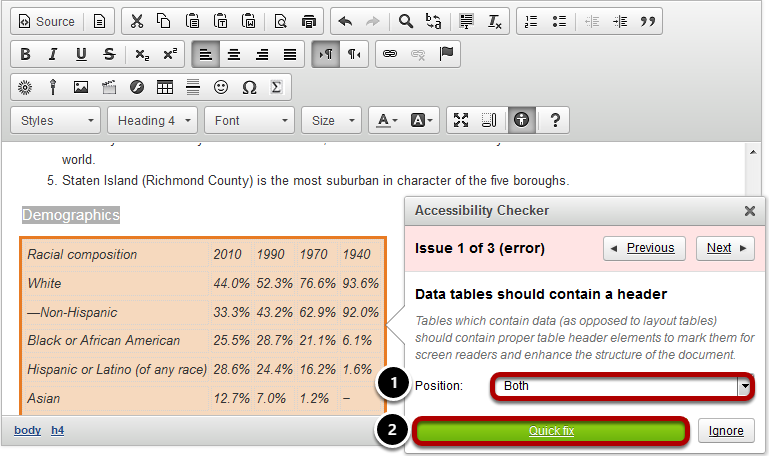 Sometimes the accessibility checker cannot provide a Quick fix because the suggested fix requires editing your text. For example, if you have a list of items that has been created by typing "1), 2), 3)" rather than using the Numbered List button, the accessibility checker will warn you that you need to select the text and make it into a real numbered list, so that users of assistive technology can navigate it more easily. If you need to make manual changes, select the X icon (Close) in the top-right corner of the accessibility checker. Edit your document's content accordingly. Select the Accessibility Checker button again to continue checking.